Cutch has 3 homers in last 5 games, make it 4 in his last 6 after tonight. McCann went deep on Price in the last meeting between the two. Clayton Kershaw vs. Arizona Diamondbacks – You won’t believe Kershaw’s ERA against the D’Backs this year, 5.28. Yes you are reading that right, time for him to get this numbers down. Kershaw goes 8 strong tonight giving up 1 run with 11 Ks. BOOK IT! Hector Santiago vs. Miami Marlins – Don’t want to pay the price for Kershaw? Give me a cheap play in Santiago today. Last 3 starts = 17 innings, 2 runs, 15 Ks and 6 BBs. I like him to do some work tonight which would let you stack some hitters as well. Movie of the Day – Dirty Dancing – Smooth Swayze in this movie, Love it. Plus “Time of my Life” is one of the best songs ever in a movie. There will be some interesting mid-range and cheaper players who will emerge to target. 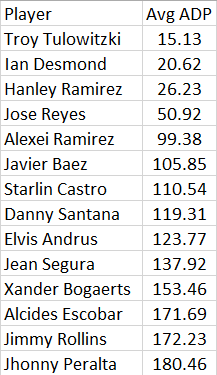 Using the splits view, here are the shortstops that excel against southpaws. Doing these articles has really helped me to identify some players who were not on my daily fantasy radar. 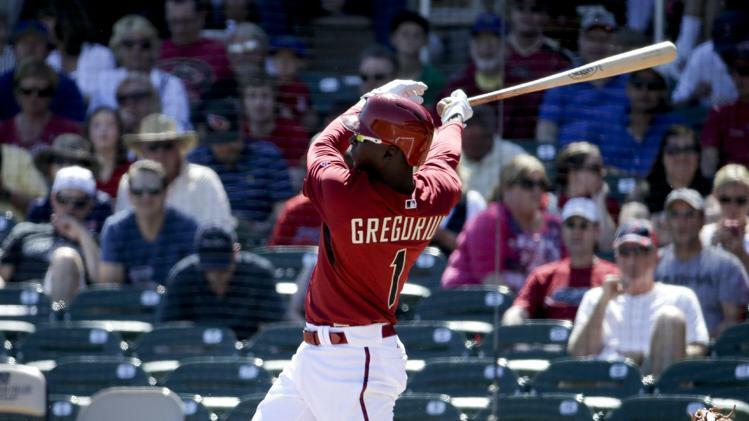 Case in point is Didi Gregorius, who is quietly emerging in the dumpster fire that is the Diamondbacks. While Chris Owings got the fantasy love early in the year Gregorius is coming into his own and makes a great cheap option going forward against right-handed pitchers. I never would have thought that Erick Aybar had more RBI versus righties than Tulowitzki but it is right above. Two other sneaky plays are Danny Santana who was red hot before his injury but seems to be making adjustments and Josh Rutledge who will never replace Tulowitzki, but for daily and yearly leagues is filling in admirably. It isn’t always about having the most talent at a position, but the right matchup. That is why the splits are so important to monitor during the season. 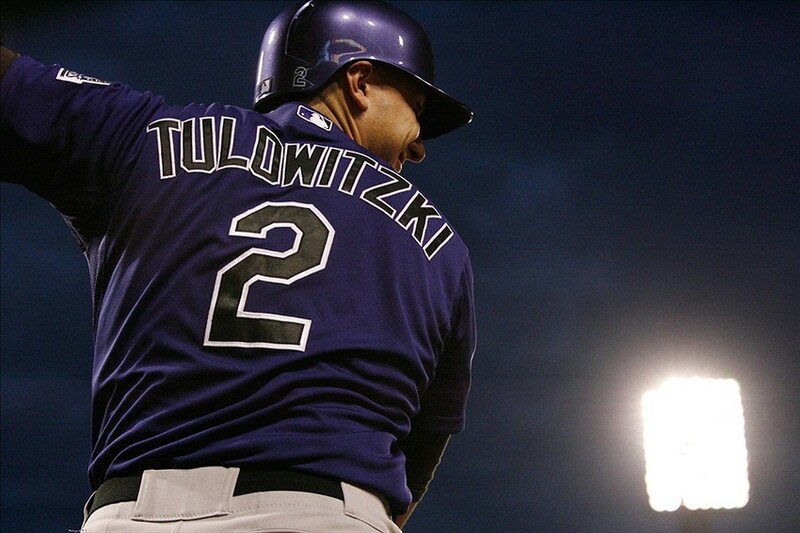 “Tulo” has been the best SS in the game over the past year. Feeling lucky, punk? Some players that have upside, albeit with some risk are Brad Miller, Xander Bogaerts and Danny Santana. The ZiPS projections seem to favor Miller but if he continues to bat at the bottom of Seattle’s order it will be hard to get to the runs and RBI predicted above, but he is worth a flier in the second half. I find it hard to believe that Xander Bogaerts will not rebound and even if the Red Sox become sellers, this is an offense that can provide runs. Danny Santana made his debut and took on the look of Jean Segura from a year ago with his fantasy splash. However, he has struggled since his return and learning to hit the ball to the opposite field will be a key in his development, but if he hits leadoff for the Twins he can still provide value moving forward. 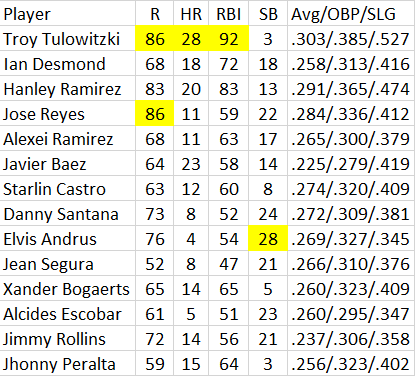 As of today, Tulowitzki and Ramirez are on the mend so their rankings going forward are tenuous and dependent upon health, but isn’t that always the case? 2. Ian Desmond – There are flashier, and higher batting averages, but his steadiness is the key (21 HR, 21 SB) in his last statistical year. 8. Elvis Andrus – Elvis relies on his speed for fantasy value. While the Rangers are struggling, this offense has to improve in the second half, right? A couple of players who just missed include the Diamondbacks duo of Chris Owings (presently on the DL) and Didi Gregorious. Either may be a good trade chip in the off-season and both are improving this year. Danny Santana is another wild card but his minor league track record suggests his hot streak is going to be hard to maintain. If the Twins leave him at lead-off he will be a cheap source for runs and stolen bases. Shortstop is a position in transition with some big minor league talent on the way. It will be interesting to see how soon some of them will make their debuts. The MLB season is upon us which means it is time for the Fantasy Baseball season. We here at the Sports Script want to do everything possible in setting you up for draft day and helping you throughout the season to win a Fantasy Baseball Championship. 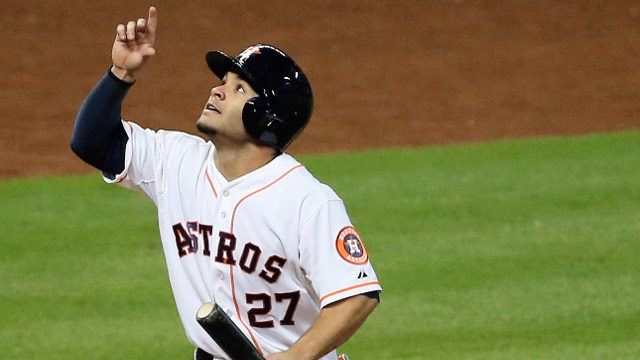 We are gathering a team of Sports Script writers as well as some special guest to answer 5 key questions about each position for the upcoming 2014 Fantasy Baseball Season. Today we have gathered me (Ricky Valero), Matt Bell and Matt Wincherauk as we are going to take a look at the ShortStop. Matt Bell – This is the one position I seem to struggle at yearly to pin point players. I think you obviously target Hanley Ramirez or Troy Tulowitzki, but of course they are both injury risks to waste a high pick on. They have a ton of reward if they don’t get hurt for you as both guys are élite players. I wouldn’t mind passing on these guys if you don’t get some value on them and taking a guy like Ian Desmond. He’s hit around .280 for his career and is a threat for 20 home runs and 20 stolen bases just like he did in 2013 again in 2014. Matt Wincherauk – I’ve always been a huge fan of Troy Tulowitzki, and he’s probably the most sure things when it comes to a short stop. He’s the guy that I’ll be targeting come draft time. Ricky – Jed Lowrie is someone I really want on all of my teams. In his 1st full season as a Big leaguer, Lowrie impressed hitting .290 with 15 HRs and 75 RBIs. He is currently ranked in the mid-teens on most draft boards and I see him sneaking among the top 8 fantasy SS this season. Matt Bell – This is tough as I don’t see one guy that I would just hate to have on my team in the top of most rankings, so I’m going with Derek Jeter here. The guy is awesome and a hall of fame shortstop, but he’s not someone I want in his final year on my fantasy team. I think some fantasy players this year with go with the sentimental pick and take him this year and I’m not one of those people. Derek Jeter I wish you all the best, but I want to win my fantasy championship! Matt Wincherauk – I am definitely staying away from Derek Jeter this year, despite him being a sentimental favorite. He hasn’t been able to stay healthy of late, and the production just isn’t there anymore. Some people will take him out of emotion. Ricky – Jean Segura – His pre and post All-Star stats are a big concern. As you will see below. Such a big difference between the two half has put a ton of question surrounding his status for the 2014 season. With really not knowing which Segura I am going to get and him having such a high price in fantasy leagues, I don’t think I will be drafting him this season. Matt Bell – The Sleeper at SS that I was going to go with was going to be Starlin Castro as I figure he will have some value this year after a terrible 2013 for his standards, but I decided that seemed to obvious. I’m going to go with a name that not many will be familiar with and that guy is Jonathan Villar. He’s going to be the starting short stop for the Houston Astros and should be batting leadoff. He hit for around .240 last year in 52 games, but was still able to steal 18 bases in that short time. He’s very fast and can be a threat for stolen bases as well as extra base hits. Matt Wincherauk – My biggest sleeper is one of the best young prospects in baseball, its Xander Bogaerts. He really impressed everyone during the Red Sox run to a World Series Championship, and now he’s looking to blow up in his first full year. 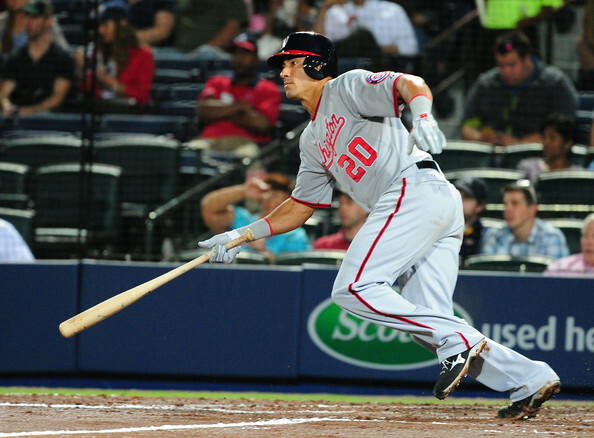 Ricky – Everth Cabrera – Cabrera has yet to play a full season and boy if/when he does he is going to be good. He has huge upside with .280 average, 50+ SBs and 80-85 runs scored as the leadoff man for the Padres. Matt Bell – The biggest disappointment this year will be those people who wait and grab Jimmy Rollins in the later rounds thinking they’ve got a steal, but in reality they’ve got a 35-year-old shortstop. 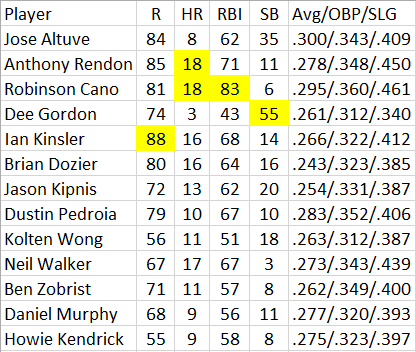 Rollins is going to be decent, but I don’t think he can be considered a top short stop option anymore and should just be passed on for some of the younger guys below him. Matt Wincherauk – Jose Reyes is my pick for bust, mostly because the guy can never stay healthy. His first year was a bit of a disappointment, and don’t see things getting better in Toronto. Ricky – Starlin Castro – One of my favorite guys heading into last season. He was a true bust and really killed all my fantasy teams. A ton of talk surrounding him being a potential “sleeper” this season and bouncing back from the miserable year he had. I just don’t see it happening, he had a low in hits, runs, RBIs, stolen bases, batting average, OBP, SLG and saw a career high in strikeouts. The patients at the plate is concerning and all the “sleeper” talk will make his stock higher than it deserves to be. Stay far away from him this season if you can. Matt Bell – The bold prediction for short stop is that we see a breakout season for Castro after his worst year. He will finish in the top 5 of all shortstop and be named to the all-star team for the Cubs. Matt Wincherauk – Despite the hype around Jean Segura and Hanley Ramirez, Troy Tulowitzki will be the best shortstop in fantasy baseball. Another 30+ home run, and .300+ average for the best in baseball. Ricky – Alexei Ramirez will be a top 5 Fantasy Shortstop in 2014. The power loss is a concern but a guy with back to back 20+ stolen bases, scores and has a solid average. Ramirez will step it up this season and Fantasy owners will sit back and enjoy. MLB season is upon us and Fantasy Baseball is back and better than ever! Over the next few weeks we are planning on getting you ready for any of the upcoming Fantasy drafts that you have. This week we are sending out our initial 2014 rankings that will be updated as Spring Training progresses. The week after we are going to answer 5 questions about each position as well as giving you some insight into some players that we like as well. Matt Bell is joining me today as we rank ShortStop as well as take a look at one guy we like higher than his ADP and one we have lower than his ADP. Ricky – Alexei Ramirez – Current ADP 14th – I have him ranked 9th – Ramirez RBIs dropped last season in a weak White Sox lineup but saw his batting average, hits, runs and stolen bases increase. Abreu added to this lineup will help Ramirez see some better pitches as well. A solid average, gets on base and steals as well, he will help you all the way around. Matt Bell – Jonathan Villar is my sleeper in all fantasy leagues this year as I really like what this guy can do. He’s got an ADP of 19th, but is all the way up to the 12th spot in my rankings. He has the potential to steal 35 or more bases this year as he snagged 18 in only 58 games last year. If you miss out on Tulo or Hanley in the 1st few rounds you can always let the SS spot fall to the late rounds and grab Villar who can help in the stolen base category quite a bit. Ricky – Asdrubal Cabrera – Current ADP 11th – I have him ranked 14th – Cabrera is on the downside of his career and honestly don’t believe he is worth a slot on the roster. In 2014, he might only be a one maybe two category guy which is just not good enough for fantasy owners. Matt Bell – Jean Segura is a little lower in my rankings than most as he’s got an ADP of 4, but in my rankings you will find him down at 7th. I think he’s a going to be a good shortstop, but we’ve only seen him play one full season so far. I want to see more from this young shortstop, before I can rank him ahead of a few guys. I’m also putting him behind Castro who I’m fully expecting to have a bounce back year and I think has a chance to equal his stats with a few more home runs. 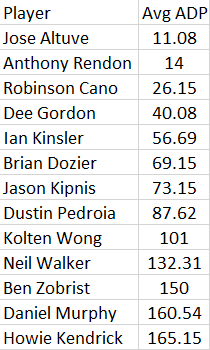 In case you missed these, here are my Catcher Rankings (http://wp.me/p2MUTr-BY), 1st baseman (http://wp.me/p2MUTr-BZ), 2nd baseman rankings (http://wp.me/p2MUTr-C2) and 3rd Baseman Rankings (http://wp.me/p2MUTr-C7).